We’ve come a long way since our first Airstream bathroom. We built out Louise on a shoestring budget, saving every last penny. We quite literally were scrounging in the couch cushions for coins, and every single yard sale we had while downsizing was poured back into the build. Kate worked three jobs, and Ellen continued teaching and commuting. There were weeks where we figured out how to eat as a family of three on $25.00 (thanks to small town grocers and the local farmer’s market), just so we could pinch our pennies and contribute to salvaging our old girl. In the time since, we’ve learned a thing or two about building bathrooms in moving vehicles, and we’ve gotten to play around with some pretty cool materials. Here’s a fun roundup of all the bathrooms we’ve built thus far, and we want YOU to submit your bathrooms for a chance to be featured right here on the blog! We built Louise’s bathroom sans sink. The shower was never used, because we couldn’t afford a water heater, and we sold Louise before we put one in. However, it was a beauty. We clad the walls in cedar planks and sealed them, and the floor was made up of a cedar wrapped lip and leftover black hexagon tile from the bathroom renovation we did in our old house. The toilet was crafted from a diverter kit (diverter and hose), 5-gallon bucket for solids, Ice Mountain jug for honey (aka pee), and a walnut toilet seat that we bought off Amazon. We crafted a solid surface with plywood that had two sections beneath it - one for the cat’s litter box (complete with a little cat door), and one for the toilet components (aka, jug and bucket). Each compartment lifted from the top, and served as a surface for TP (and a plant, because why not? ), along with a place for our toilet seat. I wouldn’t recommend this commode setup for transit, but it would work fine for a stationary tiny home. In order to save valuable space elsewhere (like the kitchen and bedroom), we opted to do a 3’ x 4’ wet bath onboard June. Kate’s dad still calls this one an engineering feat, as we were able to fit a shower w/ bench, composting toilet, sink, counter space, plumbing and the water heater (with access door) all within this space. The only thing the wet bath really doesn’t offer is dry storage space, but all tiny mobile spaces require us to make sacrifices that we don’t have to in traditional brick and mortar homes. Nature’s Head Composting Toilet fitting snugly in the bathroom. Water heater access door to the right. Cozy view from the bedroom into the shower. Always loved this particular spot when we lived in this Airstream. Tile: All Modern. Sink: Amazon. Faucet: Delta. We’ve used a variation of this design three times, both in Luna and Isla (next up) and our current client project that is in progress. This bathroom design is straightforward: there’s a separate shower with bench seat over the wheel well, a sink and vanity with storage underneath, a composting toilet, and a tiny, but manageable amount of space to stand and towel off or stand at the sink to get ready for the day. The exception with this bathroom compared to others with similar layouts we’ve designed is this plexiglass window that peers into the rear bedroom. This shower is one of the most replicated that we’ve seen - and with good reason! The window makes the shower/bathroom feel much larger than it’s footprint. The bathroom here is 3’ x 5’. The tile was sourced from All Modern. The clients had barn wood that was sentimental to them, and they brought it to us in hopes we could create surfaces with it. While much of it wasn’t usable and was too rotten, we were able to salvage a lot of it and create some incredibly beautiful and rustic countertops for the whole space. Nature’s Head Composting Toilets are our preferred toilets for our renovations. Composting is not only better for the environment, but enable you to go off grid for longer. Click to buy. 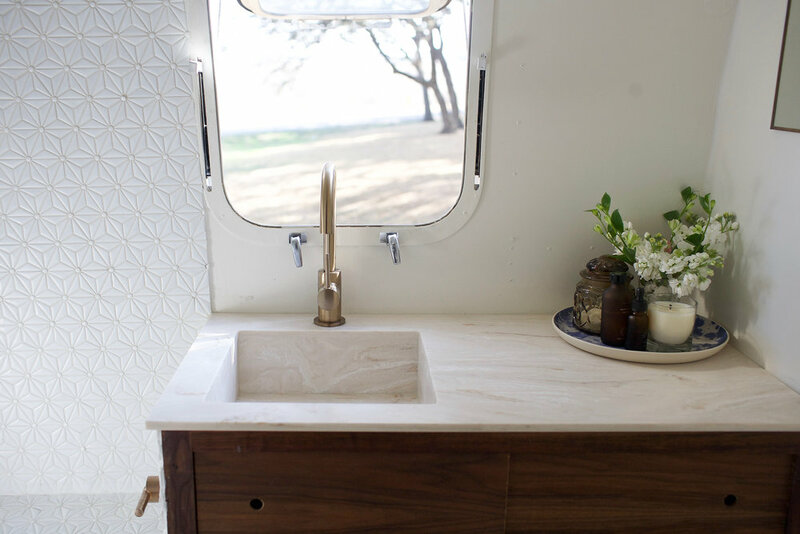 In terms of stunning Airstream bathrooms, Isla’s takes the cake. Hell, it kinda looks like cake: white wedding cake with whipped white frosting and gold ribbons. I think Isla’s bathroom shows how diverse our design work can be - Ellen and I are much more natural and earthy when it comes to our own spaces, but our client’s taste was far more polished, feminine, and even a tiny bit glamorous. This bathroom design has the same floor plan as Luna’s, though reversed. The shower is on a wall shared with the kitchen, while the toilet/vanity shares a wall with the bathroom. Fun view through the mirror, which is a great way to photograph these tiny spaces. All the bathroom fixtures are from Delta, and are available right here on our resources page. 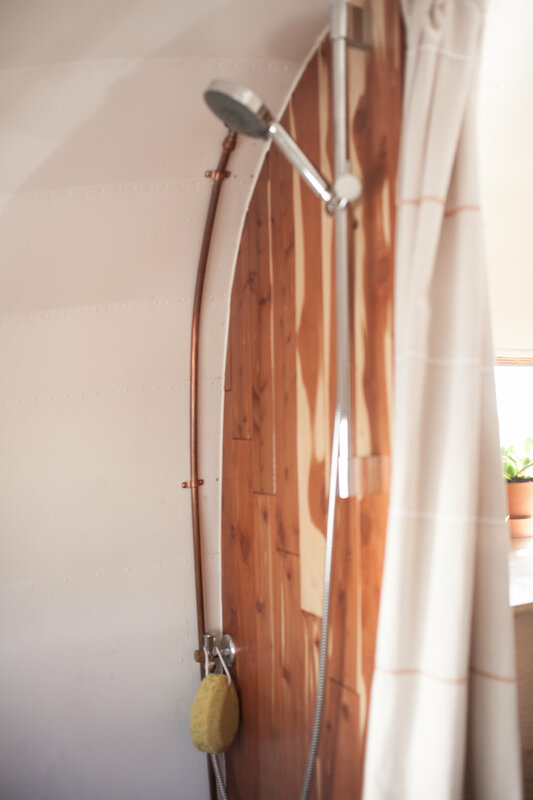 We love installing hand held showers on a sliding bar like this one for an Airstream shower. We have one in our Airstream home, and we love it. You can slide the bar down and have a seat on the bench without having to hold the shower head, OR you can use the hand held to rinse the bottom of the shower pan out or bathe your pups in warm water. It’s really versatile and we highly recommend it. We have been using these sliding bars with hand held shower heads since we built out this bathroom: they make so much sense! We installed the shower mixer just to the right of the entry point of the shower. This allowed us to install a pocket door in this bathroom, because there wasn’t any plumbing impeding the installation, and the clients loved that they wouldn’t have to get their arm doused with cold water when reaching in to turn on the shower. 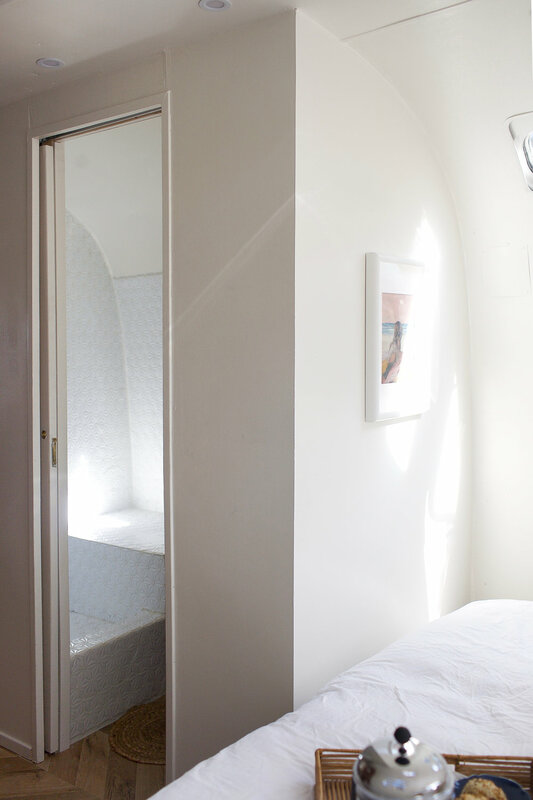 Sneaking a peek into the bathroom, which closes off with a slimline pocket door, from the spacious bedroom. The shower tile is from Lowe’s. Bird’s eye view. It’s not much floor space, but it’s enough to step out of the shower and then into the bedroom, where there is a generous amount of floor space in front of the double his-and-hers wardrobe, a place to rest your toes when using the commode, or to stand and get ready while looking out the window at the beautiful landscape. The sink dimensions were custom designed by us, and the sink and countertops in the bath and kitchen are Corian Solid Surface and were fabricated by a local Corian dealer. We have since used solid surface in other projects and fabricate them ourselves to save time and money. This sink’s dimensions are perfect for a tiny onboard bathroom, and looks spatially correct. This bathroom was super tough to get photos of, and thus, we don’t have a lot! However, here it is. The bathroom in this project was divided into two sections: a powder room of sorts with a sink, toilet, and vanity, and on the other side of the hallway, a shower. The shower was not done at the time we had to leave and head to our next project, as we decided to hire a subcontractor for the work. He bailed and left us hanging (which is a big reason we don’t work with subcontractors) at the final hour. Hopefully one day we’ll be able to share some photos of the finished product with you all. Solid surface countertop by Hanex, fabricated in-house. Sneaking around the corner and getting a snap of the toilet and our signature custom pocket doors, this time done in popular and stained a rich, warm tone. Hope you guys enjoyed our first roundup! We have two more projects we’re currently working on: our Airstream home and a client renovation, and we’ll be very excited to share these two very different spaces (and their onboard bathrooms) when they are finished this fall and winter. Don’t forget to submit your own Airstream bathrooms for a community roundup post! We ask that images be submitted via Dropbox to hello@themoderncaravan.com unedited and high-res for consideration!